To say I have been busy is an understatement. The same is true for the rest of The Fearless Cooking club members. Thanksgiving came early this year, darn it. I have to work 3 days this week and family is coming in. 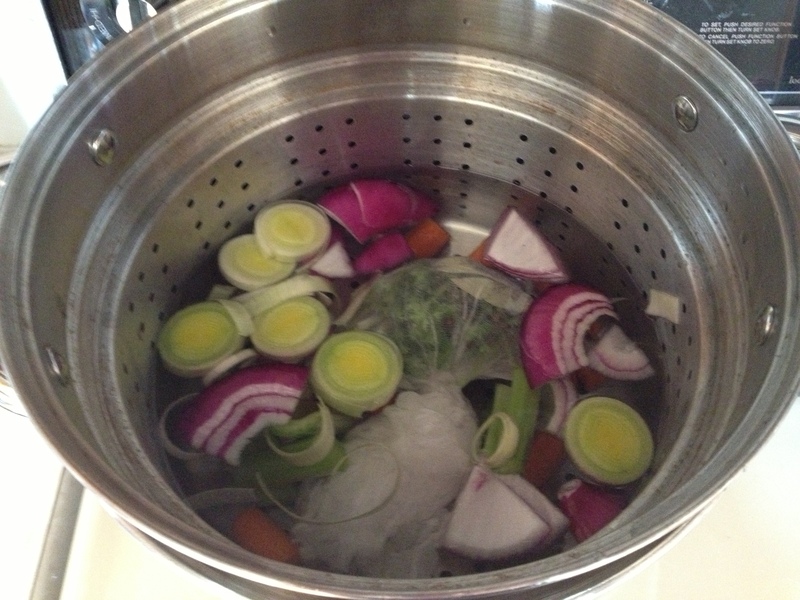 I made something I have never made before and I could give it to my fellow cooks: turkey stock. I used Alton Brown’s Chicken Stock recipe . If you look at the recipe it says it takes 14 hours. 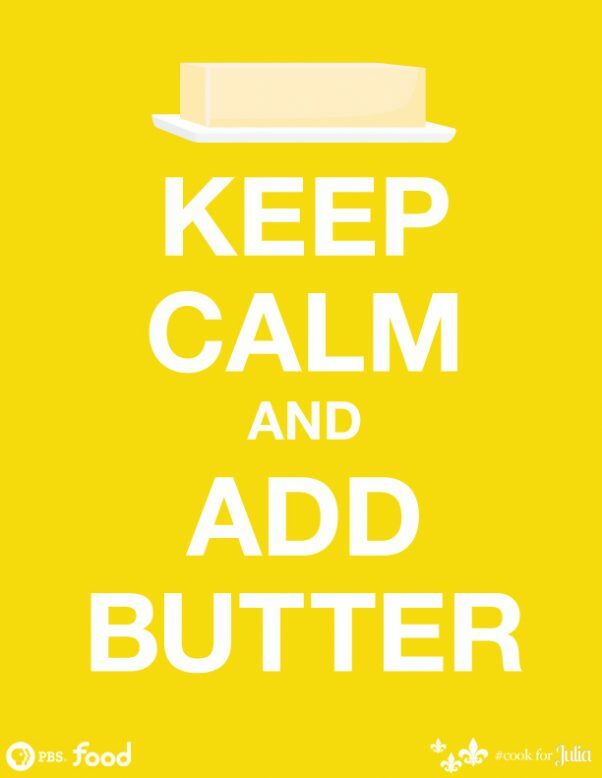 What a great recipe to put on the stove and forget about while cleaning the house. 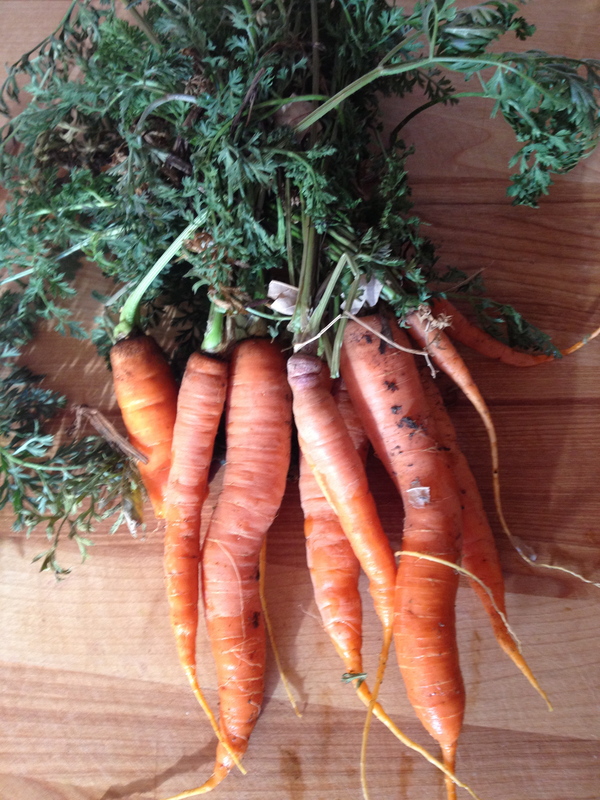 The carrots were the final product of the garden and added to the stock. Two gallons of water with the veggies. Four turkey thighs added to the pot. 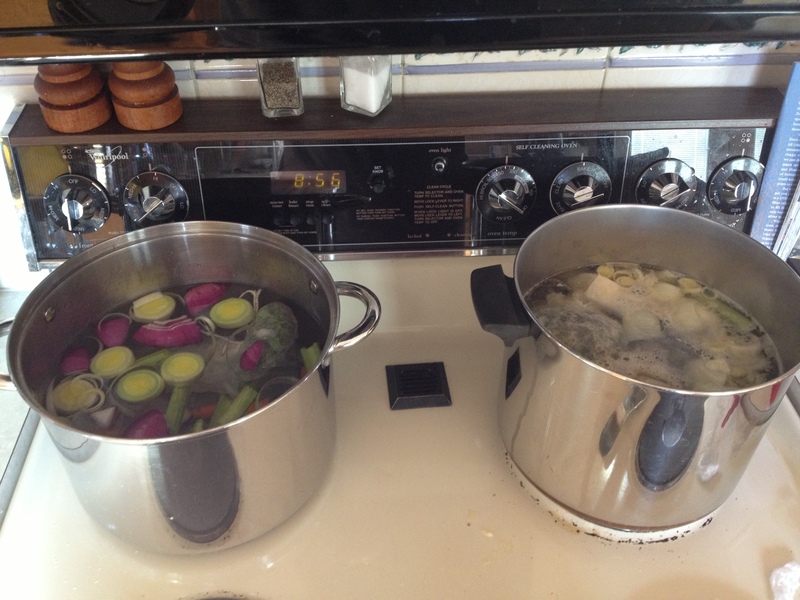 I didn’t have a stockpot big enough so I divided it into two pots. 1. Don’t tell Alton Brown but I didn’t follow his recipe to the letter. 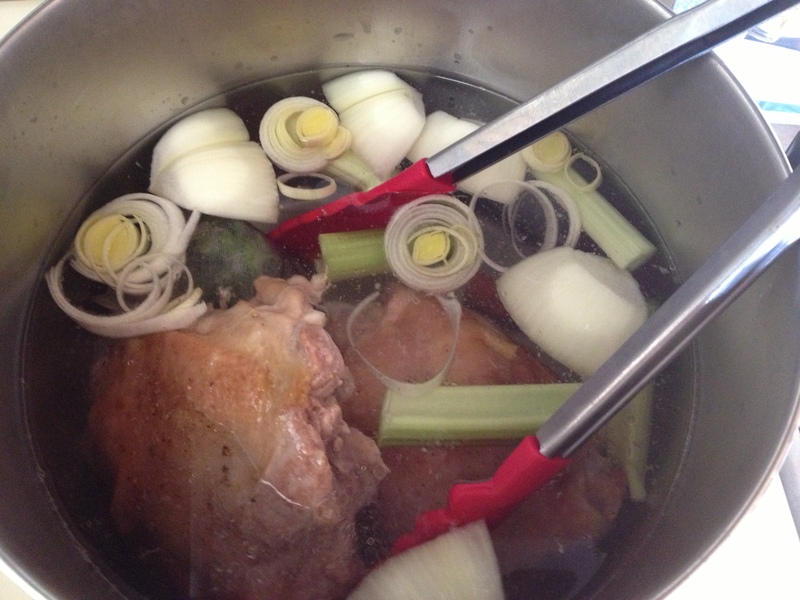 I used four turkey thighs that I roasted in the oven then added it to the stock pots. I read once that roasting the meat brings out great flavors before making gravy so I thought it would work for stock as well. 2. At the end of the day, I used the turkey meat and one quart of the stock for turkey noodle soup. It was a nice meal at the end of a long day of cleaning. 3. It made exactly five quarts of stock as the recipe stated. 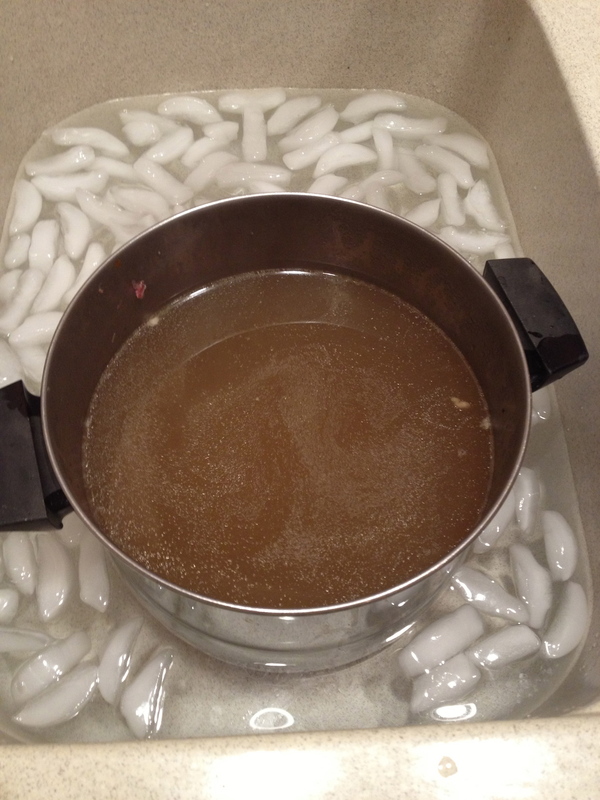 The slow, medium-low heat reduced the mixture into a fine concentrated stock. I will be sharing the stock with Joy and Char as they use it for their gravy or stuffing. 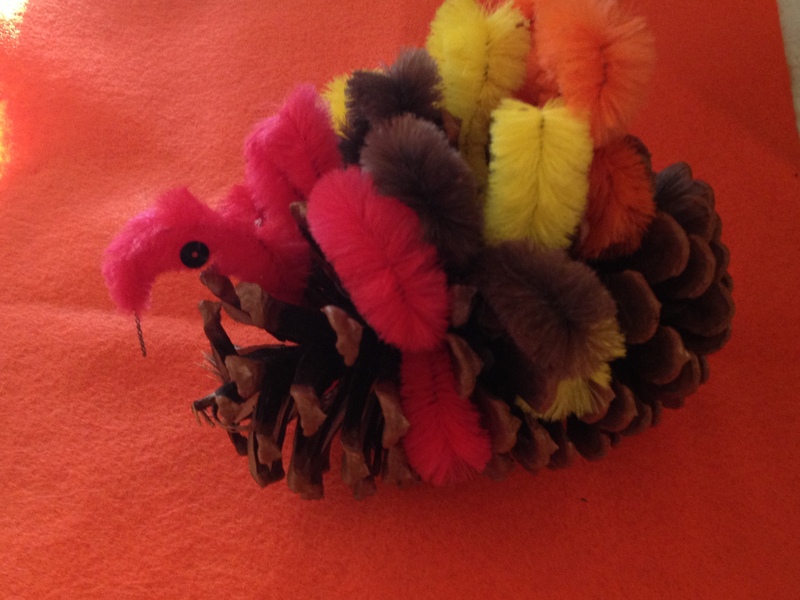 This cute little turkey made of pipe cleaners and a pine cone, made by my mother many, many years ago. I won’t be able to spend the holiday with Mom and Dad. They are getting older and I get out to visit them every two months. 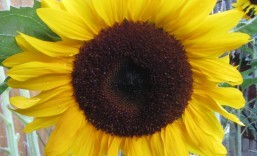 Each visit is a precious moment of remembering good times, despite the daily challenges they face. Thanksgiving is a holiday of purely being thankful without any pretenses or expectations. Happy Thanksgiving Mom and Dad. This entry was posted in comfort food, cooking, Food, Soup, Thanksgiving and tagged Alton Brown, cooking clubs, food, soup, stock, Thanksgiving. Bookmark the permalink. My version may have had less fat. AB’s version was probably more gelatinous and more fat to skim. Nevertheless not difficult. AB is fussy about people following his recipes. I met him at a book signing last year. I told him about our cooking club making his version of Paella, he said to me ‘I hope you made on a open grill’ which I told him I did, he was pleased/relieved. Yes good soup, tender and moist turkey. 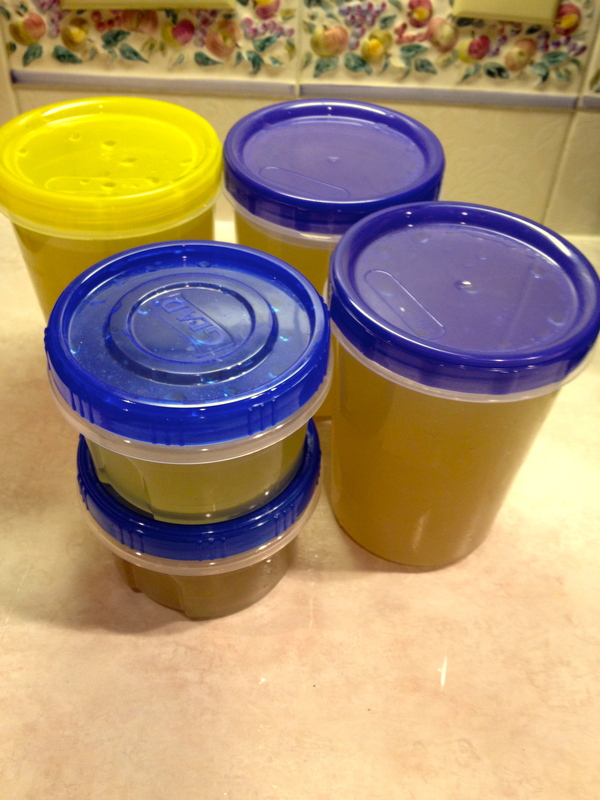 Cooking club members took 2 quarts of stock and my husband held onto the last two that are now in the freezer. He got a little possessive.